QUESTION: Is there any insulation between the grill and the smoker in the hybrid model? ANSWER: We could make one with 30 in char grill if you want. In the hybrid the char grill and smoker are separate of each other and not plumped into one another. QUESTION: Does Lang offer an insulated firebox option? ANSWER: The fire boxes are not insulated and are made of heavy 1/4 plate. We suggest a layer of firebrick in the bottom of the fire box under the fire grate. This enables the easy scooping out of ashes for clean up and it pushes more heat into the smoker with less transferred to the ground or deck. They also makes it more of a wood miser. The Hybrids are Great units and the Feed back has been very good. Hybrid customers tell us “some part of the hybrid gets used almost everyday during the week”. 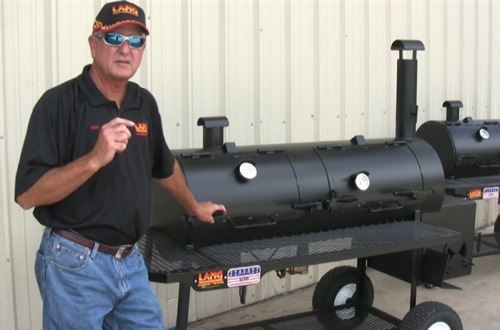 More information about the Lang 48 Hybrid patio smoker cookers.